Ingredients: Main Dish – Chicken Breast, butter, shallots, Balsamic vinegar, chicken broth, fresh marjoram. Side – Broccoli, lemon juice, splenda. Embellishments: On the main dish I used homemade turkey broth instead of chicken, and dried basil instead of marjoram. For the side, we like our broccoli nearly naked, so just opted to use butter on it rather than the Splenda and lemon juice. Comments: This was a fabulous Emeals dish. Easy to prep, small number of ingredients, and awesomely tasty. I don’t usually buy shallots (I just sub in onion), but this time it was worth the extra cost. 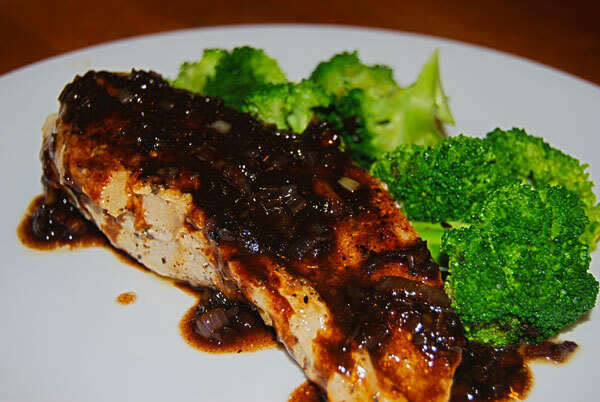 I only needed one, and the flavor it imparted to the reduced Balsamic sauce was fantastic. For the side dish, I just wasn’t interested in combining lemon juice and Splenda to drizzle over the broccoli – instead I drizzled it with a little melted butter. Thumbs up from the family and I !